Simon Newcomb was born at Wallace, Nova Scotia, son of John and Emily Newcomb. He went to the United States in 1853, and studied at the Laurence Scientific School at Harvard; he was awarded a B.Sc. in 1858. 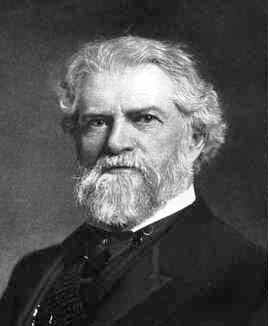 In 1861, Newcomb received a Commission in the Corps of Professors of Mathematics in the United States Navy, and was assigned to the United States Naval Observatory in Washington. In 1877 he was put in charge of the American Nautical Almanac Office in Washington where he commenced the calculations of the motions of the bodies in the solar system. In 1884 he obtained the additional appointments of Professor of Mathematics and Astronomy at Johns Hopkins University, and held this latter position until 1893. Newcomb was awarded at least 17 honorary degrees, including degrees from: Columbia, Yale, Leyden, Harvard, Heidelberg, Edinburgh, Dublin, Padua, Oxford, Glasgow, Cracow, Johns Hopkins, Toronto, Cambridge. In 1874 he was awarded the Gold Medal of the Royal Astronomical Society, and in 1878 the Huygens Gold Medal of the Holland Society of Science. The Royal Society of London presented him with the Copley Medal in 1890, and the Imperial Academy of the Sciences at St. Petersburg awarded him the Schubert Prize in 1897. Newcomb was elected a member of the National Academy of Sciences in 1869, and was later elected a Foreign Member of the Royal Society of London and a Fellow of the Royal Society of Edinburgh. He was promoted to the rank of Rear Admiral in the United States Navy in 1906, and was named to the American Hall of Fame in 1907. He died in Washington in 1909 and was buried at Arlington National Cemetery.